John Swinney v Douglas Mill at the Justice Committee - serious corruption revealed in Chief Executive's own attempts to thwart claims, which led to Mill's resignation. Now that you have watched the above video, and read my earlier report on Mr Mill's resignation, you should not be surprised to learn that earlier last week, documents were apparently being circulated by some aggrieved members of the Law Society, showing Mr Swinney's mortgage claims on his Parliamentary expenses account. 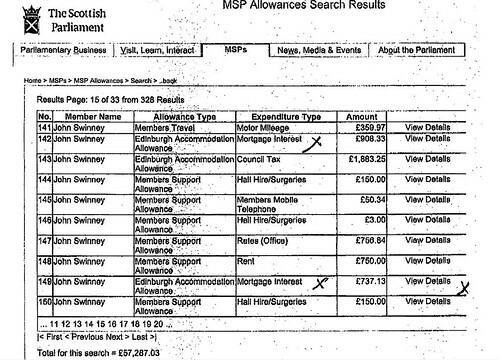 The documents currently doing the rounds show among other things, Mr Swinney receiving regular payments for mortgage interest at around £900, with, curiously enough, even a 19pence stamp making the claims book. The documents, apparently released by members of the legal profession, who clearly support Douglas Mill and the Law Society's policy of beating down complaints against solicitors with a stick or anything higher, don't particularly show anything we don't already know, but I am slightly amazed myself at the size of the claims and seemingly attention to detail, while Mr Swinney's constituent, and others mentioned by him not only in that confrontation with Douglas Mill, but also within the Parliamentary debate on the LPLA Bill, have not yet seen their cases achieve a measure of settlement. John Swinney speaks in the Scottish Parliament on corruption within the Law Society of Scotland and interference with innocent people's access to justice. As you know, I am a supporter of Mr Swinney, particularly over his courage to take on Douglas Mill in front of the Justice 2 Committee in 2006, and really get to the heart of the issues which have been burning up the public over their poor treatment by the Law Society of Scotland when it came to making complaints and financial claims against either negligent or crooked lawyers. I simply don't think that anyone else, with the exception of Phil Gallie, would have had the courage to ask those questions and take issue with Mr Mill, as John Swinney clearly did. Surely Mr Swinney has been in government long enough now to ensure these cases attain a measure of settlement and closure, for the good of his constituents, the others he mentioned, and the interests of justice and the Scottish justice system as a whole. It's not too much to ask or expect I think, for people to be given closure and peace of mind over wrongs which were perpetrated against them by the legal profession itself, and if the Cabinet Secretary for Finance, Mr Swinney, cant put this issue on the table now and get it fixed for all concerned, we are living in a very sorry state of affairs in Scotland. Aside from the seemingly endless ranks of crooked professionals who take advantage of the elderly, ill and incapacitated when there is a hint of controlling their money, those who can be or appear to be closest to a person, can pose the most risk to that individual they are protesting to care for - as many stories in the national press have revealed over the years. Endless examples exist of the likes of lawyers, carers, doctors, accountants, etc, who seemingly take it upon themselves in what would appear a noble gesture, to look after someone not only doing so as the professional they are, but also as a friend. My own mum, sadly, was a victim of such a scam, where a relative, and the executor of my late father's estate, who both hated me intensely, decided to claim everything for themselves, and followed the well trodden routes those people who engage in these scams do. The documents which accompany the above article are a fairly straightforward presentation of how people go about taking their victims money, little by little, then the lot, from the poor informed person they protest to be 'looking after' or seeing to their interests ... all the while only doing it for the money of course, spreading no end of poison, hurt and lies against people who may pose a threat to their little scheme to take the money, and sparing no effort to split families, relatives, friends, even communities, to cover their tracks at every turn until of course, they are found out and exposed. Firstly, it begins as a few suggestions, perhaps attempts to disgrace close members of the victims family so they are kept out of the picture, making sure no one gets to find out what is going on, then the work of the con artist begins, of taking control over a victims money, their entire estate, taking the 'power of attorney' (which effectively is giving your life away when you agree to it), and the poor victim being coerced into handing over enormous 'gifts' such as property, huge sums of cash, bank transfers, and 'loans' (never to be repaid of course), and investments which obviously no one would hand over unless they had been bullied or coerced into doing so. Heres a fairly typical example reported in the media of someone preying on an informed victim : Iain Catto, a former solicitor and senior Scottish Conservative, still with many connections within the Tory party, who robbed his disabled client, whom Catto called a 'friend'. Iain Catto, offered to look after the finances of Francis Fleming, 59, after he became partially paralysed following a savage assault. Catto, who was sacked from his job as a solicitor for gross misconduct, was found by the court which sentenced him to jail, to be regularly taking money from Mr Fleming. A former Conservative councillor who stole £70,000 from a disabled client who depended upon him as a close friend has been jailed for 27 months. Disgraced Iain Catto, 41, offered to look after the finances of Francis Fleming, 59, after he became partially paralysed following a savage assault. Catto, who was sacked from his job as a solicitor for gross misconduct, was regularly taking money from Mr Fleming. Catto pleaded guilty at Edinburgh Sheriff Court to the theft. He was stealing sums of £11,000 and £9,000 at a time between December 2002 and 2004 from the criminal injuries pay-out his client had received. He even sold some of his victim's shares to get more cash. Sheriff Kathrine Mackie told him: "You callously took funds from Mr Fleming to support yourself when you knew that he depended on that money and you. It was a gross breach of trust." Mr Fleming's son Frank MacLennan, 42, hit out at the sentence outside the court. He said: "That is not long enough for what he did to my father. He should have been given at least three or four years." Edinburgh Sheriff Court had heard that Catto, a member of Lothian Regional Council from 1990 to 1994, frequently asked Mr Fleming to sign blank cheques pretending to look after his finances and had bank statements sent to his home address. Mr Fleming, who was left partially paralysed and impaired following an attempt on his life in 1968, trusted the solicitor so completely he even gave him a key to his Craigentinny Road home in Edinburgh. Meanwhile, Catto was buying himself airline and train tickets for the UK and abroad, hotel rooms, restaurant meals, computer software, £300 worth of goods from Oddbins and expensive haircuts. Catto carried on with the scam until he was found out by Mr MacLennan, who moved from Inverness to Edinburgh to look after his father in July, 2004. Mr MacLennan said outside of court: "He bled my father dry. We had been planning to move to Spain but now that idea is gone. He lied to my dad and me from the start. "Although he has repaid the money he cashed in shares that were earning my dad an income. I discovered the stealing when I saw my dad writing blank cheques and looked into it. "I feel very angry and my dad is devastated and hurt. He considered him to be a very close friend and depended upon him." Mr Catto of course, always protested he had the best interests of his poor client & 'friend', Francis Fleming, at heart - this being a common protestation of those who loot and plunder the vulnerable. Another not too distant example of this kind of 'feasting off the elderly, infirmed & vulnerable, came with a Daily Record exposure of a Priest, who took control over a frail widow's affairs. A FRAIL widow with dementia signed over control of her £1million fortune to her priest. Catherine MacNeil, 85, gave a £120,000 house to Father Mustaq Azad, and he took control of the affairs of her disabled son. Fr Azad flew to his native Pakistan after police were called in to investigate the affair. His superiors in the Catholic Church had told him repeatedly to give up his involvement in Catherine’s finances. Catherine’s angry niece, Morag O’Halloran, 45, of Irvine, Ayrshire, said last night: “This has been an absolute disgrace. A priest is in a position of trust. “Anybody knows an 85-year-old with dementia is not in the frame of mind to make huge decisions, like handing over her home and rights to a man she hardly knows. Catherine, of Campbeltown, Argyll, was a regular worshipper at Fr Azad’s church, St Kieran’s, in the town. She spent much of her spare time there, helping at bake sales and organising events. Catherine met Fr Azad three years ago, when he took over the parish after arriving in Scotland as a missionary from Pakistan. The pair became friends and he began to visit her frequently at home. Catherine had a massive stroke in February 2004 and dementia set in soon after. Morag said: “It was tragic. She has never been the same. Social services began helping to look after Catherine and her son Ian, 49, who has a rare genetic disorder which causes learning difficulties. Then, in March 2005, Catherine gave Fr Azad power of attorney to handle her financial affairs. Seven months later, the priest took on the same responsibility for Ian. Fr Azad did not tell Morag about his role in her aunt and cousin’s lives. Catherine gifted the priest her second home, a £120,000 cottage on the Hebridean island of Barra. And six weeks later, according to Morag, he put the house up for sale. Catherine is now back in hospital after suffering a second stroke. And Morag claimed that Ian, who needs constant care, was left to “fend for himself” as his mum’s condition worsened. She said: “We discovered he’d been left without his medication for 10 days and had been cooking himself fish fingers every night in the deep fat fryer. “He was terribly frightened and in an awful state. He phoned and told me his house was going to be taken away and that he would be homeless. “Then we found a letter from the council saying Ian was on a list for housing. “Catherine has enough savings for her and Ian to live comfortably for the rest of their lives. There’s no mortgage on the house in Campbeltown and no reason for Ian to be given council housing. In October 2006, social workers told Catherine’s family she needed to be moved to a nursing home. Morag wanted to place her in a home in Saltcoats, a few miles from Irvine, so she and Ian could visit her. But as she tried to make the arrangements, she found out that Fr Azad had power of attorney. Morag said: “We were absolutely shocked. Fr Azad never mentioned it. He had kept us in the dark. We couldn’t believe my aunt would have given him control of her life. She hardly really knew him. “We spoke to Ian, who said he had found cheque books that belonged to his mum with Fr Azad’s name on. Fr Azad refused Morag’s request to move Catherine to Saltcoats. He also failed to hand over the old lady’s financial records and legal documents to social services. In a bid to force the priest to co-operate, social workers called in police. A police investigation began. And at a meeting on December 29, Fr Azad offered to resign his power of attorney over Catherine’s affairs. The Bishop of Argyll, Ian Murray, also intervened, demanding that Fr Azad hand over responsibility to Catherine’s family. Fr Azad was traced in Pakistan, where he is on leave, on Monday of this week. He agreed to hand over his power of attorney for Catherine, and Mora g immediately began moves to have the old lady placed in Saltcoats. Morag said: “It is unbelievable that social services were forced to call the police to make a priest help an old woman. She added: “Catherine will be given 24-hour care and is in safe hands. In the hospital she has fallen so many times and doesn’t have the care she needs. They don’t have the staff and they need the bed back. Catherine’s family now plan to force the priest to hand over his power of attorney for Ian. A church source added: “Fr Azad was advised from the start not to accept the power of attorney or ownership of the house. “He was told repeatedly to hand the post back. The Bishop last told him at the beginning of January and expected it to be done immediately. James McEwan, of the law firm representing Fr Azad, said: “Mrs MacNeil gave the house in Barra to him as a gift. I know she took financial advice. Police said: “Inquiries were carried out but this is not a criminal matter.” Argyll and Bute Council refused to comment. No word yet on further developments, but the same pattern of control, and huge unexplainable gifts being given by the poor victim to those who seek to control all their money for themselves, exists in all of these cases. So, it seems there is little protection for the elderly, infirmed & vulnerable when it comes to long lost relatives or professionals turning up on the scene when there is a hint of getting some money ... surely its time to correct that, and ensure there is a power to detect and intervene in such a situation long before the con artist gets most of the poor victims money, and ultimately gets away with it too while the victim is left penniless, and the family split through the poison of those seeking to take all the money for themselves. A NURSE systematically plundered £300,000 from the life savings of the dying doctor she was supposed to be caring for. Isobel White was hired from a private agency to look after reclusive GP William Derek Wilson, who was suffering from a chronic brainwasting disease. Bachelor Dr Wilson, 76, amassed a fortune with his frugal lifestyle. He wore clothes he'd had for decades, still had his parents' furniture and spent just £14-a-week on shopping, surviving on a diet of ready-made shepherd's pie. White, who earned £36,000 a year as a live-in nurse, was employed by Positive Nursing Agency to provide 24-hour care for the confused OAP. She quickly transformed his lifestyle ...and her own. She booked a £8000 Mediterranean cruise for them both. She also bought a house with a £100,000 loan from Dr Wilson then persuaded him to change his will and sign over his £250,000 flat to her. Court papers even accuse her of forging the doctor's signature on a £28,000 cheque payable to her. White was quizzed by the police days after the doctor died of progressive supranuclear palsy - the same condition that killed actor Dudley Moore. A theft prosecution was dropped but White was sued after lawyers for Dr Wilson's estate said she used "undue influence" to "induce" him to give her cheques "at a time when he had neither the mental nor physical capacity to do so". She could not repay the missing money - now almost £400,000 with interest and legal fees - and was bankrupted. Two flats she owned - including the doctor's old home in Pollokshields, Glasgow - were repossessed. Now she faces being evicted from the £350,000 home she shares with her 79-year-old mum in nearby Newlands. Last night White, 53, claimed she had planned to pay Dr Wilson back and said she "tried to breathe new life into him". She added: "Dr Wilson was a reclusive, withdrawn man who didn't take care of himself. "His clothes were decades old and his furniture had been owned by his parents. It was clear he had no real enjoyment in his life. "I started taking him on outings, encouraged him to buy a new wardrobe and start enjoying life. We became friends. "I encouraged him to take holidays and accompanied him so he was looked after properly. "He paid for a 19-day cruise on the Oriana but took ill and had to be flown home." White claims she began quizzing the doctor about his will because she was concerned about what to do if he died. She said: "His first will left almost everything to a cousin he'd told me he didn't like. When I pointed that out, he called the lawyers and changed it. "He asked me what I wanted, so I told him I would really like his flat, so he agreed." The second will - written in September 2000 - left the flat to White and £400,000 to his friend, accountant Douglas Anderson. After the doctor was taken to hospital it emerged White had received large sums including a £100,000 "loan", £60,000 stock transfer and cheques. She said: "I fully intended paying him back from the sale of two flats - one belonging to me, the other to my mother who was moving in with me. "But before I could get those properties on the market, Dr Wilson went into hospital." He died in Mearnskirk Hospital on May 31, 2002. A fraud investigation was launched into transactions totalling almost £300,000 but White was told in September 2006 there would be no proceedings against her. She said: "I will go to my grave swearing I didn't take money from Dr Wilson. "Those cheques were to pay household expenses such as a special hoist to lift him and an orthopaedic bed." White continues to work as a nurse because she is not under the jurisdiction of the Nursing & Midwidery Council. An NMC spokesman said: "Our code of conduct states nurses must refuse gifts, favour or hospitality that might be interpreted as an attempt to gain preferential treatment." The latest attempt at reforming Scotland's judiciary has been described as 'not worth the paper it's written on', by Lord McCluskey, formerly one of Scotland's senior judges, now a Labour peer in the House of Lords. The former Court of Session judge made the assertions during his testimony last week to the Scottish Parliament. As you know, I have criticised Lord McCluskey for his criticisms of proposed reforms to the legal profession and judicial system, but in this case, he is probably correct, and the Judiciary & Courts Bill itself, which is currently being heard by the Scottish Parliament's Justice Committee should be at the very least, cleaned up quite a bit, and quite a dose of accountability & transparency added to it. For instance, perhaps a more open, transparent appointments system than simply leaving it to the Lord President to appoint judges, may bring a little more in terms of public confidence to Scotland's creaky self serving legal system, which doesn't seem to have any will to change with the times, and certainly not adhere to the public interest, rather, adhere to it's own .. The office of Lord President seems to enjoy far too many powers, lacking accountability to anyone as Lord Hamilton's comments seem to indicate, but that really sums up the whole of Scotland's legal system - lacking accountability to anyone but itself, which is why the rest of us are almost enslaved to it, even being denied access to justice when it suits the legal establishment to keep people out of the courts or even decide an individual be denied access to legal representation. The Lord President, Lord Hamilton is involved in many appointments to the legal system, not just those of appointing members of the judiciary, and only recently his role, along with Justice Secretary Kenny MacAskill in refusing all applications made by non members of the Law Society of Scotland to gain rights of audience & representation under Sections 25-29 of the Law Reform (Misc Provisions) (Scotland) Act 1990 brought into question the motives of the current legal establishment for keeping the legal services market closed, as a business monopoly for its own. Revisiting Lord McCluskey's comments that the Judiciary & Courts Bill is not worth the paper it's printed on, this does bring back memories of former Scottish Legal Services Ombudsman Linda Costello Baker's comments against the Legal Profession & Legal Aid (Scotland) Act 2007, which she called "a mess", and of course as we now know, she was correct in her claims - the Scottish Legal Complaints Commission which has sprang from the LPLA Act, has been happily and easily co-opted by the Law Society of Scotland, and Ministerial appointments to the Commission itself have seen a bunch of lawyers and ex Law Society Committee members appointed to it, giving the air that it will be injustice as usual for anyone who has problems with a solicitor in Scotland. Do we call that reform ? I don't think so .... and no doubt the Judiciary & Courts Bill, if it does make it through the Justice Committee, may well go the same way as the LPLA Bill when it was at the Justice 2 Committee in 2006 ... voted through and passed into law .. then turned on its head to serve those it sought to reform, as any attempt at reforming Scotland's legal system seems to end up in the bucket. Maybe we should therefore listen to Lord McCluskey this time, and make sure that if the Judiciary & Courts Bill does go through, it serves a common purpose of transparency & accountability, not simply serving the judiciary itself..
You can read more about Annabel Goldie's resignation in 2006 here : Annabel Goldie does the right thing and resigns from Justice 2 Committee Convenership but it seems that having a JP in charge of hearings on judicial reform is, amazingly, not a conflict of interest ... those tories must be up to something then .. trying to make the bill fail perhaps ? Here follows some coverage of the Parliamentary hearings from both the Herald and Scotsman. The plan to enshrine in statute the independence of the judiciary, praised last week by Scotland's most senior judge, was described by a former solicitor-general yesterday as "not worth the paper it's written on". Lord Hamilton, the Lord President told the Holyrood Justice Committee last week that the proposal in the Judiciary and Courts (Scotland) Bill "sends out the right message" against a day in the future when "conflicts could arise between the judiciary and the executive". But yesterday retired judge and former law officer Lord McCluskey told the same committee: "The evidence you heard last week was, with respect, naive. The simple answer is it could never be more than symbolic, because if an unpleasant government came to power, then do you imagine it would not behave like the governments in Zimbabwe or Pakistan? "If a party comes to power which does not respect democratic values then this is not worth the paper it is written on. Just as this Parliament could pass it a week on Monday, it could repeal it a week on Tuesday. This is actually worth nothing at all." Lord McCluskey added: "Most countries in the world have a written constitution in which the independence of the judiciary is embedded in the constitution. Judicial independence lies in the hearts of men, not in constitutions and statutes of this kind, and I would rather it stayed there." Calling the proposal "just a kind of gesture politics", he said: "The English needed it and so we slavishly copied the English. We have never had a statutory declaration in Scotland. We don't need to follow slavishly and plagiarise English legislation." The bill would give the Lord President formal recognition as the head of the Scottish judiciary, making him responsible for matters such as the training, welfare and conduct of the judiciary. There would also be new procedures for appointing and disciplining judges and for dealing with public complaints. The legislation also sets out proposals for modernising the machinery for sacking judges and sheriffs on the grounds of unfitness for office. They would be investigated by a tribunal chaired by a judge and containing a lay element. Lord McCluskey said: "In my time there have been judges on the High Court bench who drank too much, who didn't do their homework, who didn't turn up. They were dealt with by the Lord President behind the scenes, and dealt with successfully, and that's the way it has to work." On attracting a wider cross-section of society to the Bench, Lord McCluskey said: "I can see merit in the government, whether through the (judicial appointments) board or otherwise, taking steps to enable more people to acquire the skills that are needed to be a judge. "But if I'm going to be operated on by a brain surgeon, I want the brain surgeon to be the best brain surgeon. I don't want him operating because he's black, Jewish, Catholic. "It's the same with judges. It's the same kind of expertise which is required. I don't think affirmative action has any place in the selection of brain surgeons or High Court judges." LORD McCLUSKEY shares his concerns about the judicial reform bill, which he believes is needlessly copying measures introduced south of the Border. THE Scottish Parliament is about to devote much time and effort considering a Bill that is both unnecessary and misconceived. With the title, The Judiciary and Courts (Scotland) Bill, it is unlikely to generate mass demonstrations around Holyrood. Bewigged lawyers will not mount barricades proclaiming that "The End is Nigh". MSPs will probably approach the Bill in the belief that there must be some point to it: after all, it has been adopted by an SNP-led administration, having originally been proposed, in February 2006, in a consultation paper endorsed by Cathy Jamieson and Lord Advocate Boyd, as part of "our programme for reforming Scotland's justice system". The word "our" was and remains a serious misdescription: let me explain where the ideas in this Bill really came from. On 12 June 2003, there occurred one of the most astonishing events in English constitutional history: yes, I do mean "English". Downing Street issued a press notice announcing the abolition of the office of Lord Chancellor. When, within hours, it was realised that could not be done by Prime Ministerial diktat – because the office of Lord Chancellor had existed for eight centuries, the office holder was the head of the English judiciary with responsibilities under 374 Acts of Parliament, and only he could appoint judges in England and Wales – a second notice hastily appeared saying that it was "intended" to abolish the office. It was too late to save the then Lord Chancellor, Lord Irvine of Lairg: he retired to the backbenches in ominous silence. Lord Falconer of Thoroton took his place on the Woolsack and in Cabinet, with a brand new title, "Secretary of State for Constitutional Affairs". What had happened? What did it mean for Scotland? What had happened was that David Blunkett, the home secretary, proposed to insert into the new Asylum and Immigration Bill an "ouster" clause, preventing the courts hearing legal challenges to the decisions of tribunals in asylum or immigration applications. The Lord Chancellor, rightly, regarded that as a totally unacceptable departure from the rule of law. Both remained adamant; someone had to lose. It was the Lord Chancellor who lost. But it would have looked bad to announce that the Lord Chancellor had been defenestrated for defending the rule of law, so it was declared that the job itself had been abolished. As Lord Hoffmann said: "His removal had to be dressed in the robes of high constitutional principle." What did it all mean for Scotland? Not much. For in Scotland the Lord Chancellor had no significant functions. We had our own head of the Scottish judiciary, the Lord President. Judges here were appointed by the First Minister, advised by a Judicial Appointments Board. For Scots, the Lord Chancellor was as relevant as the Captain of the Yeomen of the Guard. In England, by contrast, eight centuries of tradition and legal structures had to be demolished and replaced in a hurry. So the new secretary of state set about creating a fresh constitutional structure for the English legal system. He entered private negotiations with the Lord Chief Justice of England and Wales. There was no place in these discussions for the Lord President, the First Minister, the Lord Advocate, the Advocate General, or Scottish Law Lords – not altogether surprisingly, because Scotland's legal system was not affected by the loss of the Lord Chancellor. The negotiations produced a "Concordat", providing new ways to carry out the Lord Chancellor's English functions. The new scheme was enacted in the Constitutional Reform Act, 2005. The Lord Chief Justice was given a new title, "Head of the Judiciary of England and Wales". For appointing judges, England copied the Scottish system, creating a Judicial Appointments Commission. And, most interestingly, because the English regarded the Lord Chancellor as the guardian, within government, of the independence of the judiciary, it was decided that an entirely new guarantee of that independence was needed; so the new Act declared that government ministers had to respect the independence of the judiciary. Of course, Scotland had no need of such an enactment, because the Lord Chancellor had no comparable role in relation to the independence of Scottish judges. Nor was any such role necessary, because Scottish public servants, both in government and judiciary, knew in their bones that ministers, like everyone else, had to respect, and invariably did respect, the independence of the judiciary. That fundamental tradition of respect had endured without challenge in Scotland for centuries without the need for a Lord Chancellor or a statutory declaration. So what does the new Bill do? It slavishly copies the English Constitutional Reform Act, 2005. It creates a new title, "Head of the Scottish Judiciary" and confers it on the Lord President, along with numerous administrative functions that he has never had, or needed, and which will make unacceptable inroads on the time and energy he has for carrying out his real function, which is to safeguard and develop the unique character of Scots Law. Next, it provides a "Guarantee of continued judicial independence". The word "continued" acknowledges that judicial independence already exists. And whose duty is it to provide that "guarantee"? Answer: the First Minister, other ministers including the Lord Advocate, and everyone responsible for the administration of justice. Surely these public servants, especially the Lord Advocate, would be the first to declare that they already have such a duty at common law and that to neglect it by "seeking to influence particular judicial decisions" would be to pervert the course of justice. As the "guarantee" imposes the duty only on those named, what about others, spouses, uncles and partners? What about Donald Trump? The simple point is that the duty created in the Bill already exists. The Bill neither guarantees nor extends it. If anything, it limits it. It does not even create an offence of "influencing judicial decisions". The Bill abounds in similar nonsenses, especially in relation to the appointment of judges. Let us hope that MSPs recognise its uniquely English features and have the courage to reject them. A PROCESSION of Scotland's biggest wigs lined up to give evidence at the Scottish Parliament's justice committee last week, convened by Bill Hamilton, including Lord Hamilton, the Lord President and Lord Justice-General, and Lord Osborne, one of our longest-serving judges. Compared to a day in court, there was not much pomp or ceremony about the proceedings, with the judges looking almost ordinary in their suits and raincoats. But the fact that they were there at all, publicly discussing their role and the implications of the Judiciary and Courts (Scotland) Bill, was extraordinary enough. There has been much criticism of attempts by the former Scottish Executive and the current Scottish Government to bring forward legislation to reform the judiciary. There are others who are better placed – including Lord McCluskey on these pages today, to analyse the detail of the proposals in depth. But, having had the opportunity to listen to sat Tuesday's oral evidence, it became obvious to me that there is much about the way the current system operates that could be improved. The headline-grabbing issue was of course Lord Osborne's criticism of the procedures used by the Judicial Appointments Board in hiring judges, namely the absence of any formal checks as to the performance or competence of candidates. For example, he said no-one would bother to contact a sheriff principal to ask whether a sheriff was the subject of any disciplinary proceedings or outstanding complaints. Lord Osborne also poured scorn on a system that relied too heavily on performance at interview, which he regarded as an unreliable indicator of suitability for the bench. While interviews are of course a necessary evil for most people seeking less elevated positions, clearly the Judicial Appointments Board should be able to provide much greater reassurance that such jobs are being filled on merit, and only after a robust assessment of a candidate's suitability. The problem is that it also emerged that judges apparently want to have it both ways. Lord Hamilton said that he still needs to be able to give a "tap on the shoulder" to fill temporary judge positions. Given the huge workload and degree of responsibility that judges must bear, is this fair on either the candidates stepping up to the plate or the public whose fates may rest on their decisions? The absence of a formal complaints procedure for those who wish to raise concerns about the conduct of a judge – as opposed to using the appeals process to challenge a judicial decision – was also a concern. Lord Hamilton was not able to give a figure as to the number of complaints that he receives about judges' conduct. No doubt when he produces the figures, as requested by the justice committee, it will emerge that he does not receive that many at all. But, however small the number, there should be a far greater degree of openness and transparency about the rules and procedures involved. To leave everything to the discretion of the head of the judiciary, no matter how upstanding a fellow, seems too heavily weighted against the complainer. The argument that introducing a formal complaints procedure would lead to more complaints simply does not hold water. Surely there could be discretion to weed out vexatious or frivolous complaints? And, more importantly, there could also be an opportunity for the judiciary to learn from the few complaints that might actually be justified. The Judiciary and Courts (Scotland) Bill may well be flawed, and the justice committee may well want to suggest amendments before the bill proceeds to the next stage in the parliament. But the judges have already demonstrated that the issue at stake here is not whether change is necessary or desirable, but whether the Bill as drafted offers the best way of going about it. While in-house lawyers such as those working for the notorious Government Legal Service for Scotland (GLSS) and other public bodies hope to escape paying the bulk of the new levy of "around £400 a year" to fund the new Scottish Legal Complaints Commission, the remainder of the Scots legal profession will have to pay the full amount plus the practicing certificate which is currently £735 a year, if of course, lawyers want to remain lawyers. However, while the Law Society of Scotland are grumbling over the amounts to be paid by various factions of the legal profession, attempting bargains based on the rate of complaints that the likes of in-house lawyers or members of the Faculty of Advocates receive, the true picture of how the formation of the new SLCC is taking place is being slightly skewed, it seems in the benefit for the legal profession itself. For a start, most of the staff of the new SLCC are migrating over from the Law Society of Scotland itself, many of those staff being qualified lawyers or those studying to qualify for the LLB and thus gain a practicing certificate, which the Law Society itself controls via admissions exams and awards at it's whim. One wonders the, why there is such a fuss over who pays for what when all that is really happening is a piece of 'musical chairs', where the legal profession is, yet again, getting its way with its members migrating into the new 'independent' body to carry on investigating complaints against fellow lawyers, in the very same manner they have been doing for years at the Law Society of Scotland. 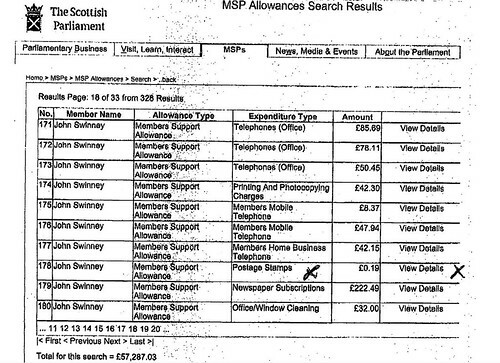 Those highly paid £300 plus a day 'appointees' from Mr MacAskill. are ex-Police, lawyers and ex members of Law Society Complaints Committees who have tactically come out of the Law Society of Scotland to 'join' the new 'independent' SLCC. Still think the new SLCC will be independent ? Would anyone out there like £300 a day plus expenses to sit & look at complaints against fellow lawyers and friends in the legal profession ? Nice little earner isn't it .. getting £300 a day plus expenses to do a few inevitable whitewashes on crooked lawyers while leaving the poor client ruined as is usual at the Law Society of Scotland. Even the new Chairman of the SLCC, Jane Irvine, the current Scottish Legal Services Ombudsman acknowledges she wasn't consulted on the backgrounds of some of those appointees, one of them being a lawyer whose legal firm has worked in key cases involving the notoriously corrupt Master Insurance Policy of the Law Society of Scotland, which saw revelations by Cabinet Secretary for Finance John Swinney of massive corruption by Law Society officials right up to the Chief Executive Douglas Mill. You can read more about John Swinney's revelations on corruption in the Master Insurance Policy and at the very heart of the Law Society of Scotland here : Law Society boss Mill lied to Swinney, Parliament as secret memos reveal policy of intervention & obstruction on claims, complaints. It does seem that what was planned to be an 'independent' commission to consider complaints against crooked lawyers has actually been co-opted by the legal profession even before it has come into existence, such seems to be the power and influence of Scotland's legal establishment and its members, who are bent on keeping control of regulation, complaints, and the public's access to justice for themselves. 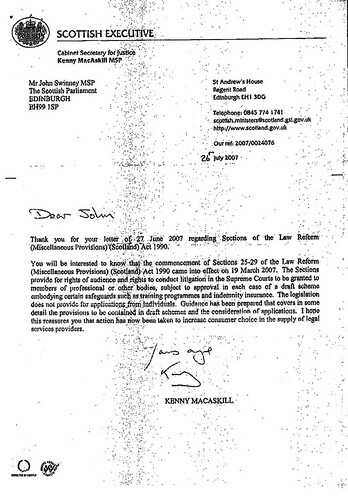 The current Justice Secretary, Mr MacAskill, as duly obliged his colleagues at the Law Society by following orders, despite the revelations from Mr Swinney in key areas which should have affected to a much greater extent the appointments and formation process of the SLCC which now looks little more than a "new" Law Society of Scotland, staffed by the same people, with many of it's allies and former members at the most senior levels of the Commission itself. This is not what was envisaged as an 'independent' organisation to deal with complaints against the legal profession. This is just another corruption of the regulatory issue, and an insult to all Scots who are users of the poor legal services we are currently forced to take from closed shop Scots legal services market. Lets hope someone has the guts to create a proper fully independent organisation to look into complaints against the legal profession and maintain regulation in an opened legal services market, not this half way house already infiltrated by the legal profession itself. That person who could create such an organisation, is not Mr MacAskill. Here follows the Scotsman's take via an LLB hopeful, which also gives a take on Richard Keen, the Dean of the Faculty of Advocates who criticises the fact the Faculty has no representation on the new SLCC. SOLICITORS can expect to pay a levy of around £400 a year to fund the new independent body being set up to handle legal service complaints, it has emerged. The Scottish Legal Complaints Commission (SLCC) is consulting the Law Society of Scotland and Faculty of Advocates on its budget proposals – including the levy that the professional bodies will have to collect from their members. The figures, which have still to be finalised, would see most solicitors pay an annual levy, estimated at £420. Combined with the practising certificate fee – which is currently set at £735 a year – the cost of continuing to wear the badge of solicitor is likely to rise to more than £1,000 a year. But it is likely that in-house solicitors, who make up around a quarter of the profession, will be offered a significant discount to reflect the fact that they rarely receive complaints. The In-House Lawyers Group has won support from the council of the Law Society of Scotland in recommending its members to pay a third of the levy, or around £140. Newly qualified solicitors are also set to receive a 50 per cent discount, in line with the fact they pay only half the practising certificate fee during their first three years. As the commission is due to open in October, half-way through the financial year, all lawyers will be asked to pay a half-year levy to cover costs for its first six months. Advocates will also have to pay the levy, at a rate being estimated at around £332 a year. But Richard Keen, QC, the dean of the Faculty, revealed he has written to Kenny MacAskill, the justice secretary, to express his "fundamental concern" about the prospect of "taxation without representation". Keen points out that advocates have no member sitting on the commission, and have generated far fewer service complaints (just 26 a year) than solicitors (around 3,500). "We are not represented on the commission, but we are being asked to pay its budget," he says. "We are being asked to pay an annual levy on a per capita basis. The illustrative figure is £166 per person (for six months]. That means the Faculty is going to have to pay around £160,000 a year to the commission. That is not so they can deal with 26 complaints, because they are only dealing with service complaints. We are talking about something of the order of ten complaints that are going to be dealt with." He adds: "What concerns me is we may have created an enormous mallet to crack a very small nut as far as the Faculty is concerned. We are paying far, far more than solicitors in order to have this commission deal with service complaints and yet we are the ones with absolutely no representation on the commission. That appears to me to be inequitable." Keen added the levy would end up being reflected in the fees charged to clients. "We have to remember that every layer of bureaucracy has a cost, and someone has to meet that cost, and generally it ends up being the consumer," he says. Philip Yelland, the Law Society of Scotland's director of client relations, says the rate of the levy would reflect the fact the commission was going to cost double what was originally forecast. "The budget is still at a draft stage," he says. "One of the things we have been very conscious of is that the cost of the commission is significantly in excess of the original (estimate]. When this went through the finance committee of the Scottish Parliament, the figure was £1.5 million. It is now around double that. "I think the commission will cost what the commission costs, and they have to set a budget that is fair and reasonable." But he acknowledged its initial budget could not include what revenue might be generated by case fees – as it is not possible to forecast how many complaints it will deal with – and the commission will have an ongoing responsibility to consult the profession annually. "They will have an additional source of income which will be case fees," he says. "That is something that clearly, in year one, they can't include in their budget." While the Law Society of Scotland will no longer handle service complaints, solicitors should not expect to see a reduction in the cost of their practising certificate, he adds. "To say a levy at £400 per annum would mean £400 could come off the practising certificate would be an unrealistic expectation," he says. "If they start on 1 October, our role won't stop. We have still got conduct complaints to deal with (and] we are being given additional powers to deal with unsatisfactory professional conduct." The society will also need resources to address the impact of the commission's decisions on standards, he says. But Yelland adds the society is already working closely with the commission to ensure a "smooth transition" from the new complaints handling system. "We have had a very good positive constructive discussion with them," he says. "They are setting up a new body and judging how many complaints they will get. "They have clearly recognised that we have been dealing with service complaints since 1989 and they have been very keen to learn from us. "They have been very keen to talk to us, and we have been very keen to pass on our experience and the information that we have." Jane Irvine, chairwoman of the commission and the current Scottish Legal Services Ombudsman, says work is ongoing to set the levy and rates. But she adds that the commissioners recognise the need to "budget wisely". "Members of the SLCC are currently working on setting a budget for the first year of our operation, and considering how case fees should be charged," she says. "In doing this, we are extremely conscious that we owe duties to everyone who will use our service to create an efficient and effective body, so we must be adequately funded and operate a practical case fee system. "We want to create systems that work effectively and lead to early resolution of complaints. We also recognise we owe duties to the legal profession and to their clients to use the independence we have to plan commercially and budget wisely, as ultimately our costs will be levied on the legal profession." Janet Hood, chairwoman of the In-House Lawyers Group, says she is pleased the Law Society of Scotland is supportive of a substantial discount. She concedes the cost is "hardly a bank-breaker" for most employers, but argues that in-house lawyers rarely generate complaints. "We are hoping to pay about a third of what the commission fees will be," she says. "I do hope the commission will listen to not only the In-house Lawyers Group but to the Law Society of Scotland. And if there are lawyers with the commission, they will be in-house lawyers too." While to many, independence means a break from whatever foul acts or perceptions of wrongdoing, lack of freedoms, unaccountability or lack of honesty exist in an organisation, public body, or even a country, the Scots legal establishment have taken on the 'independence' word as an argument to retain control over itself and all things relating to the law, from appointments to regulation, to just about anything it feels is within it's sphere of influence. This is not a new argument to the Scots legal establishment however, who in the form of the Law Society of Scotland, used the same argument in 2006 in an attempt to thwart the progress of the now passed Legal Profession & Legal Aid (Scotland) Act 2007, which brought a measure of independent regulation to the legal profession, attempting to cure the high rate of corrupt complaints investigations carried out by the solicitors own self regulatory body, the Law Society of Scotland. Douglas Mill, the Law Society's Chief Executive, famously threatened the Scottish Parliament & Executive with legal action, declaring after drafting in an English QC to assist in writing legal opinions, that it was and is a solicitor's "Human Right" to regulate complaints against colleagues .. and thus taking away regulation from the Law Society of Scotland would be a breach of ECHR. Unsurprisingly, Douglas Mill's threat of court action to stop the much needed legislation failed, but it did have an effect of galvanising some politicians in the parliament to speak out somewhat more than they had previously, particularly regarding the now Cabinet Secretary for Finance John Swinney's position on matters, where a stinging confrontation between Douglas Mill & John Swinney before the Justice 2 Committee saw revelations of serious corruption and fraud within the Law Society's Master Insurance Policy, run by the equally infamous insurers Marsh UK. You can read about the bitter public confrontation between Douglas Mill & John Swinney here : Law Society boss Mill lied to Swinney, Parliament as secret memos reveal policy of intervention & obstruction on claims, complaints. Now, in 2008, the 'independence' argument is being presented again, this time by those higher up the ladder in the Scots legal establishment, to thwart changes proposed in the forthcoming Judiciary & Courts (Scotland) Bill, which is currently under consideration by the sole Justice Committee of the Scottish Parliament, chaired by Bill Aitken MSP, a self confessed fan of Douglas Mill. Senior judges appeared earlier this week before the Justice 2 Committee and criticised parts of the proposed judicial reforming legislation, particularly raising points relating to the Judicial Appointments Board, where Lord Osborne, Scotland's longest serving judge claimed the Board was not carrying out its duties properly. Lord Osborne said: "It's my understanding that the board has set its face against making inquiries about how the individual candidate may have performed his professional or judicial responsibilities before that appointment arises. "For example, if a sheriff is seeking appointment to a more senior judicial office, the board does not enquire of others how that sheriff has performed." He added: "This is not a happy approach. You are blinkering yourself to sources of information I would have thought are highly valuable." Why shouldn't such information be published ? Don't the rest of us deserve to know who these judges really are and what they have been doing before they were a judge ? "If we cannot trust the Lord President of the Court of Session to observe the rules … then it is a sorry day." Lord Hamilton the current Lord President who is currently in charge or has a powerful 'say so' in appointing just about everyone to anything in any area of the Scots legal establishment, faired no better, with an insistence that he should be able to "tap someone on the shoulder" for an emergency appointment ... another great vote for 'independence of the judiciary'. It is quite clear there needs to be significant judicial reform in Scotland, with much needed accountability & transparency brought to admissions, regulation and all matters relating to Scotland's judiciary, and while their lordships will no doubt resist such ideas to the bitter end, perhaps even daring to bring a few legal challenges, quiet threats, or even a few case rulings to 'teach government a lesson or two', at the end of the day, the public interest and the interests of accountability must be served, thus such reforms will win the day, albeit in a slightly watered down version. The Lord President, Scotland's most senior judge, appeared for the first time before MSPs yesterday and made a strong plea for the judiciary's independence from government to be enshrined in law. Welcoming Lord Hamilton to the justice committee, convener Bill Aitken said it was a unique occasion as he could find no precedent for the Lord President addressing a parliamentary committee. The country's top judge gave evidence on the Judiciary and Courts (Scotland) Bill at a session which included three other judges, as well as sheriffs, advocates, solicitors and representatives of the Judicial Appointments Board. Lord Hamilton was one of several senior legal figures who gave their views on the Judiciary and Courts Bill. They included fellow judges Lord Hodge, Lord Osborne, and Lord Reed, and top figures from the Law Society of Scotland and the Faculty of Advocates. Lord Hamilton backed the intention to place a statement on judicial independence on the face of the Bill, saying: "I see it as a signal, if nothing more, that there should appear in the legislation a provision for the importance of judicial independence." He stressed he did not envisage this principle being breached but added: "It sends out the right message. We live in pleasant times. Times may not always be pleasant, and conflicts could arise between the judiciary and the executive." Lord Hamilton would become formal head of the system, responsible not just for the High Court, Court of Session and Court of Appeal, but also for the sheriff and district courts. To ease the administrative burden he would be given his own separate civil service, the Scottish Courts Service, based on the model established in Dublin. Lord Hamilton stressed that he still intended to spend the majority of his time in court. He argued that if MSPs wanted to compel anyone in future to appear before him it should be the chief executive of the SCS, not the Lord President, who could be invited to attend but should not be compelled to attend, again as a bulwark for the independence of the post from political control. Similarly, there was disagreement about the planned composition of the Judicial Appointment Board. He believed that, on another point of principle, those appointed by the Government should be in a minority, with either a majority for the judiciary or a casting vote in the hands of the Lord President. Most witnesses were broadly happy with the Bill, but Lord Hamilton rejected a suggestion that training for judges should be made mandatory in law. He told MSPs that he had responsibility in the Bill for putting in place the arrangements for the training of judges. "It's a question of finding the right way of securing the ultimate end," he said, adding that his experience indicated that the best way of securing attendance of senior judicial office holders at training events was through encouragement. "There are dangers if one uses the stick too much rather than the carrot. I would say that a judicial office holder is going to be much better able to receive training if he or she has been encouraged that it is a good thing to go there, rather than by two policemen marching him or her to the appropriate place. "I would say that the better arrangement is to leave matters to me to put in place appropriate arrangements. If it is necessary then the arrangements could include matters which verge on compulsion, but I would hope it would not come to that." He also said that, in terms of a complaints system against judges and sheriffs, there were already steps in place through the Judicial Council for Scotland to draw up a Code of Judicial Guidance, a list encouraging good practice rather than a "penal code of misconduct". He made one other appeal to MSPs regarding judicial appointments. He wanted to encourage a system similar to that of Recorders south of the border, part-time judges bringing expertise to the Bench without seeking to become full-time judges. It was envisaged that these would have to go through the Judicial Appointments Board but he asked for flexibility on this. "I need to be able to tap them on the shoulder to invite them onto the bench part-time and get that trend going." SCOTLAND'S longest-serving judge has attacked the way his fellow judges and sheriffs are appointed, accusing the body in charge of failing to do enough to weed out bad candidates. Lord Osborne said the Judicial Appointments Board for Scotland had "set its face against" consulting other members of the legal profession when deciding who should become a judge or sheriff. Lord Osborne, a senior appeal judge, and Lord Hamilton, the Lord President, yesterday gave evidence to the Scottish Parliament's justice committee, which is examining a bill proposing one of the biggest overhauls of the judiciary and courts in legal history. Lord Osborne suggested inferior candidates could get the job simply because they were better at interviews, adding: "The ability to interview well is not necessarily a guide to the ability to a job under consideration." He highlighted the situation where a part-time sheriff applies for a full-time role, and pointed out that the sheriff principal would not be consulted to find out if the candidate was subject to any disciplinary proceedings. "The part-time sheriff could be given a permanent appointment when there are outstanding complaints against them which were never brought to the attention of the appointments board. That doesn't seem to be a satisfactory situation." He also criticised plans for an ombudsman to oversee the way the Lord President handles complaints against judges, adding: "If we cannot trust the Lord President of the Court of Session to observe the rules … then it is a sorry day." Sir Neil McIntosh, chairman of the Judicial Appointments Board, said it carried out disclosure checks on candidates, adding: "We also check available information on candidates from the Law Society and Faculty of Advocates." Meanwhile, Lord Hamilton, the country's most senior judge, yesterday criticised proposed new laws which would require temporary judges to be appointed by the board, insisting he should be able to "tap someone on the shoulder" in emergencies. At present, the Lord President is in charge of appointing temporary judges, and does not have to consult the Judicial Appointments Board. Lord Hamilton said the proposed system would put people off applying for temporary judge posts. He told MSPs that he wanted to see experienced advocates routinely becoming part-time judges to gain experience of the bench, adding: "In order to set that trend into place, I think I require to be able to go and tap on the shoulder rather than people filling out application forms." Lord Hamilton also welcomed the provisions in the new legislation to place a statutory duty on the government to preserve the independence of the judiciary: "I think it's internationally recognised that this guarantee of continued judicial independence should be formally established within the constitutional structure. "It's important as a symbol if nothing else that there's a recognition of judicial independence." A recent court victory in a case involving the use of the Mortgage Rights Act (Scotland) 2001 to challenge a repossession has resulted in lawyers claiming that legal aid will now be useless for mortgage rights case and that lawyers wont take on representing the public in similar legal actions. Unfortunately for the public, the best suggestion from the legal profession in the report comes from solicitor Mike Dailly, of the Govan Law Centre, where he states that legal aid is now meaningless for mortgage repossession, with the report going on to say that solicitors will probably not take on such cases in the future. A better suggestion perhaps then would be to call for the opening of the legal services market, to expand the availability of, and drive down the costs of legal representation to the public, so anyone who needs representation in such a case, and legal aid funding, can get it, without it reaching the costs currently associated with such actions. Don't get me wrong about the Govan Law Centre, I'm all for what it does and how it helps people, but just a stones throw away from Mike Dailly's own house, a poor innocent woman has been systematically victimised and abused by a Housing Association in a long running campaign designed to ruin her health and her life, which has involved using lawyers to bully and harass the lady for years, even changing her secured tenancy into an assured tenancy, without any legal basis for doing so while the victimised tenant has been and is continually denied any access to proper legal representation and justice. The innocent woman, who has been through much hardship and personal loss, has been held in sequestration for nearly a decade by a well known lawyer who is now a serving Sheriff, solely it would seem, on the basis of recovering legal costs from a negligence action against a firm of solicitors which the tenant lodged many years ago. So, how about doing something Mr Dailly ? Only a stones throw from your own house .. you should be able to manage it ? Could you manage to help a woman whose life is being blighted, abused, and ruined by a housing association and some of your colleagues in the legal profession, just so they can get their hands on her flat ? Surely access to justice should prevail and the lady's legal problems resolved to allow her to live in peace ? Getting back to the BBC coverage of the Mortgage Rights case, the new report goes on to quote Cathy Craigie MSP, the MSP behind the Mortgage Rights Act, has written to Justice Secretary Kenny MacAskill to see if he will review the law to protect the public's rights & interests ... but with Mr MacAskill constantly bowing to big business and the professions recently, there may not be too much hope of that. As for the Scottish Legal Aid Board - well, wouldn't they be better going after those financial institutions and lenders who lose these kinds of legal actions, rather than going after the homeowner who won the case ? They have plenty of money anyway, so asking financially ruined homeowners to pay back the legal expenses who won the case, while allowing the lenders to escape paying the entire costs of the case seems to be a bit one sided. Will the SNP and Justice Secretary MacAskill do something for homeowners in such cases or is this yet another step too far for Mr MacAskill in protecting the public from bullying lenders and a hungry legal profession ? The Law Society of Scotland, as we know, not only controls Scots access to justice by forcing the public to use a member legal firm and solicitor, it also flexes a strict control over entry to the Scots legal profession. This unjust control the Law Society holds over access to justice, and access of entry into the legal services market, is one of the key areas identified for reform by consumer organisations and the OFT in recent recommendations and public campaigns to provide a better deal for Scots when having to use the services of a lawyer. This policy does seem to fly in the face of recent deals which have seen the likes of Scots accountants allowed to practice in England & Wales, through entry exams & additional qualifications, and not to mention the substantial increase in Scots solicitors heading south of the border to practice in England & Wales, and further afield. Emerging reports from solicitors in other parts of Britain who are trying to enter the Scottish market show that a brick wall of silence is being applied to their queries & applications by the Law Society of Scotland's Admissions Committee, which is now caught up in a scenario of potential discrimination against solicitors from the rest of the UK who wish to enter the Scots legal market. To explain a little more about this situation, there exists a procedure by which English/Welsh and Northern Ireland solicitors may become admitted as solicitors in Scotland, the so-called Intra-UK Transfer Test. The examination was developed nearly 20 years ago and it is comprised of three written papers. The examination is administered in two 'Diets', one in March and the other in November. Additionally, with the integration of the UK into the European Union, several directives have since been introduced which permit EU nationals who are qualified as lawyers in a 'home' member state to establish practice in a 'host' member state. The LSS introduced an EU Aptitude Test to accommodate EU qualified lawyers who would wish to qualify for admission as solicitors in Scotland by examination. the Intra UK Transfer Test ('IUKTT') and the Aptitude Test for EU Qualified Lawyers ('ATEU') are administered by the Law Society of Scotland in order to permit solicitors qualified in England/Wales/Northern Ireland and EU nationals who are qualified as lawyers in EU member states to be admitted as solicitors in Scotland. Close inspection of the content of both the IUKTT and the ATEU has raised questions about the purpose and fairness of maintaining two separate examinations for access to the single profession. a) IUKTT candidates are required to answer a compulsory drafting question in Paper I Conveyancing with Trusts and Succession and ATEU candidates are not. What is the justification in exacting this requirement from IUKTT candidates when ATEU candidates are not required to demonstrate their drafting skills? b) IUKTT candidates are required to answer a compulsory question on Scots Criminal Law in Paper II and ATEU candidates are not. It appears that ATEU candidates are not required to demonstrate any detailed knowledge of Scots Criminal Law at all. Arguably the two most important areas of law in which a solicitor is likely to be involved as a practitioner are conveyancing and criminal representation. IUKTT candidates are solicitors and may have practiced largely as conveyancers. This cannot be said of ATEU candidates, who will not have acted as conveyancers in their home jurisdictions. Conveyancing is predominantly effected by notaries in EU member states, who are publicly appointed officials and not lawyers in private practice. Similarly, with respect to criminal representation, the role of solicitors in Scotland is vital because of their rights of audience in the Sheriff Court, where most criminal cases are heard. IUKTT candidates are familiar with many of the criminal law concepts which Scottish solicitors encounter in practice on a daily basis. IUKTT candidates understand the essential nature of case law in the development, interpretation and application of law in general and criminal law in particular. Much of Scots criminal procedure is comprehensible to IUKTT candidates. Unfortunately, the same cannot be said for ATEU candidates, who should not be expected to have any grip on the essential nature of Scottish criminal law. Although EU lawyers will have studied criminal law during their undergraduate law courses, the approach taken towards criminal law and procedure in Continental EU jurisdictions is very different to that taken in England and Scotland. In EU jurisdictions case law, together with learned legal writings, is illustrative and not a source of the law. The authoritative source of all criminal law is a penal code which will have been passed by a legislature. The role of professional judges in EU jurisdictions is restricted to the application of the penal code and the code of criminal procedure; they do not make the law. For an ATEU lawyer, the representation of an accused in the Sheriff Court would be a quite distinct and dare-say overwhelming experience. 1. ATEU candidates are given 45 minutes to answer examination questions in Papers I & II whilst IUKTT candidates are given 40 minutes to answer examination questions in their respective papers. Why? 2. 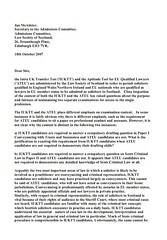 ATEU candidates are permitted the option of attempting the four papers over two sittings, which shall be deemed as one 'Diet', whilst IUKTT candidates are not. If an ATEU candidate should be exempted from sitting Paper III, EU Law and Institutions, why would he be permitted to attempt three papers over two sittings when an IUKTT candidate is not allowed to do the same? 3. IUKTT candidates qualified as solicitors prior to 01.01.1992 are not obliged to sit Paper III European Community Law and Institutions. The UK became a member of the EEC (EU) in 1973. It is salient that EU Law and Institutions is moreover a compulsory component of law courses at universities in Continental Europe. The Law Society of England & Wales instituted a standardised Qualified Lawyers Transfer Test. It is noteworthy that Scottish solicitors are eligible for admission as solicitors in England if they pass just one 3 hour 'open book' examination paper on Property. The examination on Property will be the same for a Scottish solicitor as for a New York attorney or a French advocate. Whilst the number of papers that a candidate must sit varies depending on where a candidate is admitted, the content of the papers has been standardised and is essentially fair to all who sit them. The Law Society of England & Wales does not require a Scottish solicitor to sit a different examination from an EU qualified lawyer and he is not a case for special treatment, since he is subject to the same examination conditions as all candidates. The IUKTT and ATEU are the points of access for those who wish to re-qualify as solicitors in Scotland. Unfortunately, the present arrangements appear to be flawed because they do not provide a level playing field for all candidates. I can only guess as to why there are essential differences in content for Papers I and II of the IUKTT and ATEU. Maybe because the IUKTT originated before the introduction of the EU Directive, its syllabus has not been reviewed in conjunction with the development of the ATEU? Or perhaps it has been assumed that ATEU candidates will not attempt to undertake conveyancing or criminal representation once admitted to the Roll in Scotland? Whatever the reason, the type of solicitor who will be produced at the end of the re-qualification process will undoubtedly be of a different standard to those 'native' solicitors who qualified in Scotland. One wonders whether the public in Scotland would be pleased to learn that the Law Society of Scotland is disposed to admit as solicitors candidates who have not demonstrated any knowledge of, for example, the criminal law of Scotland." The solution to this problem would be to take away the Law Society of Scotland's admissions control of entry into the Scots legal services market, and pass it to a fully independent body which can oversee and administer the qualifications & entry process to a fair, consistent and high standard, ensuring both the public and professionals get the highest standards of access to justice & legal service in a fully opened legal services market.